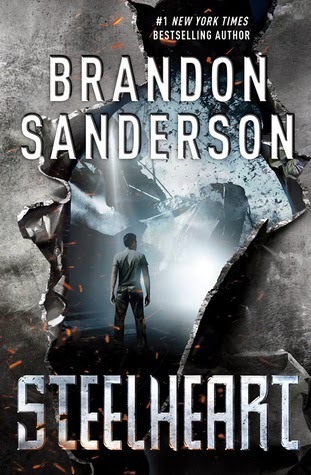 Brandon Sanderson's STEELHEART Blog Tour! Review + Giveaway! 17 Brandon Sanderson's STEELHEART Blog Tour! Review + Giveaway! Steelheart starts off with a bang, and doesn't let up throughout the entire story. We begin with David, our protagonist as a young boy who witnesses his father's death at the hands of Steelheart, an Epic who takes over what was once known as Chicago, now called NewCago. The opening prologue set the mood for a bleak and oppressive future while at once giving David that passion he develops to learn every possible thing he can about Epic's and devoting himself to becoming a Reckoner and taking them all down. Sanderson does an incredible job with worldbuilding. We are set up in NewCago, a city completely encased in steel. With steel catacombs beneath the city, and perpetual darkness due to one of the Epics above, it is a doom and gloom city where its citizens live in constant fear. Epics are an incredible twist on superheroes, once regular people when a giant star called Calamity appears in the sky, leaving a few people with otherworldly abilities. They are everything you would absolutely never want in someone with super powers. They are all corrupted. We are left with superheroes with intensely powerful and unique powers, and not a shred of morality. David was a fantastic narrator. From his awkward failure at using metaphors (which had me laughing like crazy because they were so ridiculous), to his delightful nerdiness in cataloguing all of his information on the Epics, and his awkward as can be interactions with Megan, one of the Reckoners, it was all just plain charming. Sanderson really created a relatable and likeable character in David. The Reckoners are the misfit group of people who are dedicated to taking down the Epics, one by one. I absolutely loved the way Sanderson deals with this group. We learned only a little about each member in Steelheart and I'm really hoping with the next book in the series, we really delve deeper into their lives and learn more about what pushed them into becoming a Reckoner. There were quite a few twists, and although they were a little predictable, they were still awesome and pushed the story along, as well as setting up future events in the series. I was totally engrossed the entire time and absolutely cannot wait for the next wild ride in Sanderson's incredibly memorable new series! I've heard really great things about this one. Definitely on my tbr list! This one sounds like a real page-turner. Thanks for the review. I accidentally ordered a kindle copy of this book while I was putting physical books in my Amazon cart. I still really want a hard copy though, because that is an awesome cover! I'm a huge fan of superheroes so I can't wait to read this! This book sounds really good. Thanks for the giveaway. I love Brandon Sanderson's writing. His Mistborn series and Elantris are some of my all-time favorites, not to mention the phenomenal job he did in finishing off TWOT series. Steelheart is definitely high up on my TBR/Wishlist. Thanks for the giveaway chance! This looks like an interesting book I'd like to read. Thanks for the thoughtful review. David sounds like an excellent narrator, interesting and also funny to read. I'd love to win a copy, please enter my name in the draw. I really need to read Brandon Sanderson's books. I heard they're awesome (especially Steelheart), but I haven't gotten around to it. He actually came to the Book & Co I live by in September, but I didn't go since I haven't read his novels. This sounds great. I'm excited for a new Sanderson book. Looks amazing! I can picture myself snuggled up with a blanket, cup of coffee and this great book!